Let’s admit it - vaping can become an expensive habit to maintain, if you keep spending money on buying new vaping kit sets. I personally know many friends who simply leave their old vaping kits dusting in the shelves as soon as they get a new unit. But barring a few exceptions, a lot of mods with working batteries can be feasibly used for a long while. With the right cartomizer or clearomizer units, your vaping experience can get a as good as a new, upgraded kit. One of the most popular clearomizers available in the market is the Kanger Unitank, which is manufactured by the Chinese brand KangerTech. But should the Unitank by KangerTech be your choice of clearomizer? Let's dig in further. This Kanger Unitank review is all you need to read before you actually spend some money it. KangerTech is renowned for their wide range of decent vaping products at very affordable prices. The company has plenty of products that many avid vaping enthusiasts admire. However, when it comes to the KangerTech Unitank, opinions are usually divided. On one hand, some people really like the product because of its fair options at low prices. On the other, users expecting the product to be as good as other Kanger products don’t exactly offer favorable reviews. Personally, I bought the Kanger Unitank with the idea to test it with my Smoktech Magneto. The Kanger Unitank comes in a simple paper box and consists of a clearomizer tank and three replacement coil units. The tank has a maximum capacity of 2.5ml, although you may be mistaken by its bigger tank size. This is also the first Kanger product that you can fill from the top, similar to the mechanism used in the Nova Tank. While filling the tank with the liquid, the spring-loaded mechanism comes into action and prevents overfilling. You don’t even need to remove the battery while filling the tank. However, you may want to fill the tank with a needle tip liquid bottle so as to ensure that the e-liquid doesn’t spill out or interfere with the vaping. Market reviews do indicate that the KangerTech Unitank has been a standout performer in the market globally with millions of units shipped across the world since its launch around the middle of 2013. At just under $15, or even 1/3rd of that price in some sale offers, the KangerTech is indeed a really affordable product compared to most competing products. So for vapers willing to get a bigger and better performing clearomizer tank, compared to some beginner level tank, the Unitank by KangerTech won’t disappoint. But compared to other more famous products by KangerTech like the ProTank series clearomizers, the UniTank isn’t as impressive. The Kanger Unitank sports a simple yet attractive look that can just about fit with any compatible mod. The multiple tank color options can also appeal to many. There aren’t many vaping clearomizers that come users inside 15 bucks. But if you can get a good deal, you may be able to get hold of the KangerTech Unitank at as low as $5. The Kanger Unitank comes with plenty of handy parts and accessories including two extra atomizers, decorative rings in a single pack. Compared to most entry level clearomizers, the Kanger Unitank does seem to deliver a bigger vaping volume. It’s also very compatible for use with VV mods. One of the biggest turnoffs for the Unitank is the improper sealing mechanism in the tank edges. I personally felt a tiny leak down the atomizers. Some users have also talked about leaks near the mouthpieces. Besides the leaks, I also felt threads wobbling at the top and the mouthpieces. I personally take the KangerTech Unitank as a disposable clearomizer because of its weak plastic body. They certainly haven't built it to last very long like the Kanger Protank. Many vaping enthusiasts aren’t too keen on using bottom head clearomizers due to the possibility of degradation of the flavor. Personally, I did feel a considerable loss of flavor while using the Kanger Unitank. Paper Box Case with foamed seat. In terms of price and product quality, Kanger Unitank does deliver a fair value to the customers. However, despite the above being considered, there are plenty of weaknesses that will not invite a favorable Kanger Unitank review from experienced vaping enthusiasts. One wouldn’t be wrong to consider the Kanger Unitank as a disposable Clearomizer, that will need to be replaced sooner or later. To come up with this Unitank Kanger review, I personally compared the product with the Protank and I have to admit that I was somewhat disappointed with the former's performance. However, there aren’t many quality clearomizers sets that are available at such low prices. In fact, with easy availability of r﻿eplaceme﻿nt coils and parts, users can use the Unitank for quite some while. I can thus confidently state that the Unitank by Kangertech is a product that some will like but others will loathe. 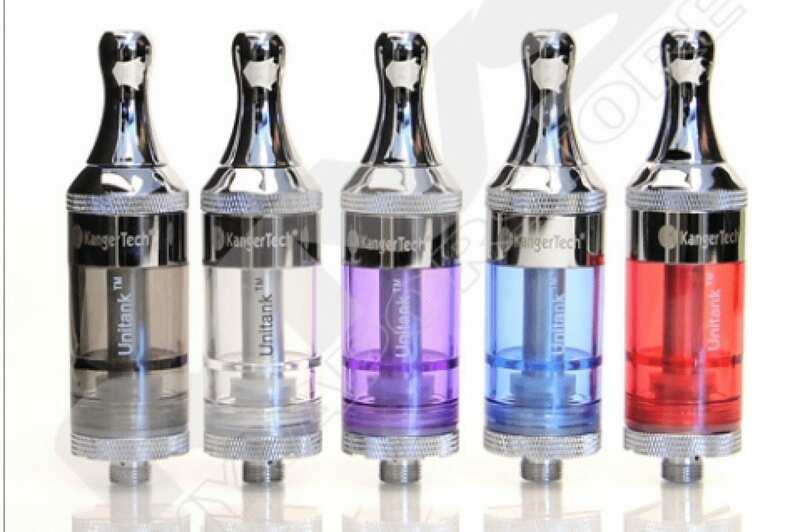 KangerTech also produces a smaller version of the product, which is the Kanger Unitank Mini. In the coming weeks, VapingCheap will also be posting a Kanger Unitank Mini review and some great Kanger offers, so don’t forget to follow our updates.